When decorating your home, it’s easy to follow the latest trends and choose a style that looks contemporary. Unfortunately, the latest home decor looks can also become outdated in just a few years. To keep your interior space looking current without having to update it each season, there are a few timeless home decor trends to choose from. Accent walls are an easy way of enhancing the style of a room and creating a focal point in the space. Consider adding wallpaper or painting the wall a bold shade for a unique look that will enhance the home’s design. Instead of purchasing trendy or modern furniture that can look dated in the coming year, opt using wood furniture from companies like The New Oak Tree for a classic style that adds warmth to an entryway or a library in the home. Wood furniture has been used for hundreds of years and continues to create a bold and inviting look. It’s important to use a blend of home decor items and accessories that are from different eras for a vintage touch that adds character to the style. Minimalism continues to look chic and sophisticated, whether you’ve created a bohemian or trendy style in the home. Limit the amount of clutter and decor that is placed on coffee tables, shelves, and on the walls for a timeless trend that looks eclectic. Area rugs work to group furniture together in a room and complete the overall look for a great way of allowing the space to appear organized. Paint the walls a similar color to the rug for a traditional look that will match accordingly. Use decorative window treatments that are a neutral color to make use of natural lighting in the home. It will allow the space to look larger in size and will create a warmer tone that enhances the comfort of the space. It can be easy to feel overwhelmed when walking into a home that has too many colors that are used on the walls, shelves, or with pillows on the couch. Limit the number of colors that you use in the space for a clean and fresh look follows a specific palette. 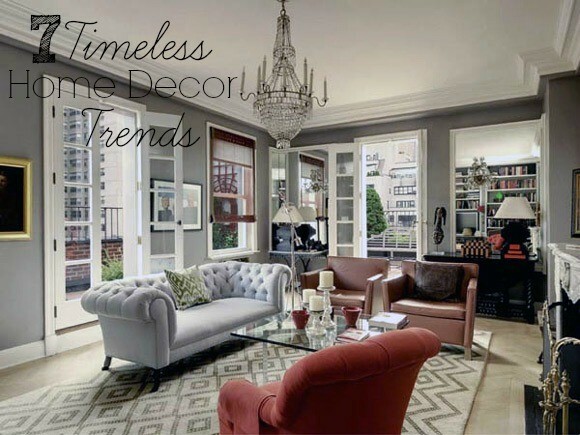 When it comes to decorating your home and furnishing it with timeless pieces and trends, there are a few ways to create a look that will withstand the test of time. By taking advantage of popular techniques that are used by professional designers, you can enjoy a style that doesn’t need to be updated or altered in the coming year. This is a guest post by Karleia Steiner. Karleia is a freelance blogger. Away from the office she enjoys spending time with her two daughters. I love the Minimalist look. I just need to get rid of A LOT of stuff!